Summer is near and Schola Cantorum Jubilate choir keeps its commitment in filling each season with music and spreading it around. In fact in the coming days, Schola Cantorum Jubilate will be hosting the University of London Chamber Choir under the direction of Colin Durrant. They will present various English choral pieces by English composers like: Byrd, Purcell, Stanford, Chilcott. 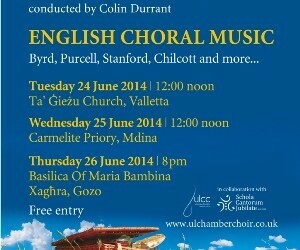 Thursday 26th June at 8pm at Basilica of Maria Bambina in Xaghra, Gozo.